police officer, unauthorized use (stealing), removing or defacing signs, and a second offense for operating on railroad tracks, cemeteries or airports or for offenses for operating while under the influence of drugs and/or alcohol. Some offenses carry a requirement to attend a Responsible Rider Safety course. Any offense that occurs within a public right-of-way can be considered a motor vehicle offense and motor vehicle laws may apply. These may impact a person’s driver’s license privileges. If an OHRV or snowmobile is involved in an offense, the registered owner may be held liable, and the registration may be revoked. Minors: When a person under 16 years old breaks the law, the officer can have the vehicle towed and impounded for up to 24 hours. A summons may also be issued. If an adult has knowledge that a child under the age of 16 was operating the vehicle illegally, the adult may be liable for the actions of the child. Loud snowmobiles and OHRVs are a primary cause of complaints from landowners and other trail users. All operators are encouraged to ride quiet vehicles. It is illegal to modify an exhaust system in any way that increases the noise level from that of the original muffler. Snowmobile noise levels must comply with the manufacturer specifications as contained in the requirements of the Snowmobile Safety and Certification Committee approval. 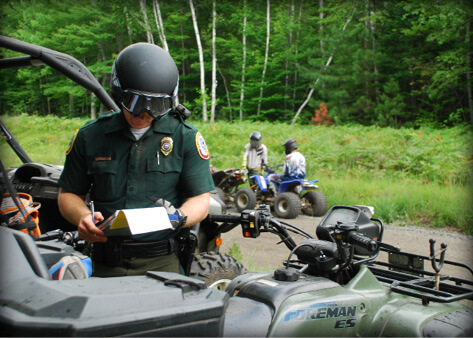 Trail bikes and ATVs cannot emit noise that exceeds 96 decibels. OHRVs designed for “closed course competition” may only be used at approved OHRV competitions, unless the OHRV is modified to meet all equipment requirements including muffler, spark arrestor and noise emissions. Snowmobile and OHRV operators must submit to a sound level test when requested to do so by a law enforcement officer. All motorized OHRVs (including trail bikes) operating in woodlands and that emit exhaust within 4 feet of the ground, must be equipped with a spark arrestor. Every year in New Hampshire, many people are injured in OHRV or snowmobile accidents and collisions; some die. Accidents often can be avoided by practicing safe and responsible operation. Besides alcohol, common contributing factors include inattention, inexperience, operating at excessive speeds, riding on thin ice, operating in unfamiliar areas, and failing to wear protective equipment. Property damage of over $500 occurs. All provisions of the New Hampshire Financial Responsibility law shall apply to an OHRV or snowmobile operated on a public highway. Any person who fails to report an accident involving death or personal injury shall be guilty of a Class B felony. OHRV or snowmobile insurance is not required to operate in New Hampshire, however, liability insurance protection is recommended. Consider other trail users, both motorized and non-motorized, including cross-country skiers, sled dogs, snowshoers, pedestrians, horses, etc., while you are on the trails. The Bureau of Trails and N.H. Fish and Game work with state associations and member clubs to ensure that your experience is one that you will enjoy and remember for a long time. Signs and trail markers are established for public safety. A great deal of time and money is spent to erect these signs to improve your riding experience. Please pay attention to them. It is illegal to remove, destroy, deface or obstruct signs and markers on trails or on private property. Violation of this law is a misdemeanor. Conservation officers are responsible for patrolling the trails, accident investigations, community outreach by working with local and state user groups and attending safety classes. If you are convicted of DWI, endangering people, damaging property, failure to yield, disobeying an officer, or skimming on open water, you will be required to show successful completion of an approved safety education class or you must attend a Responsible Riders Safety Education course.